There is no clear word for ‘disciple’ in the Qur’an. In sura 29:69 reference is made to ‘ways’ (tariqa, pl. turuq), which has the general meaning of the attitudes and practical requirements as set out in the Holy Book. The word ‘sharia’ also means ‘way’, but in Sufism tariqa acquires a more precise sense. Thus the word tariqa becomes closely associated with Sufis, while the word sharia is more generally used in other forms of Islam. For the early Jewish rabbis the word ‘path’ referred to the community. The word ‘path’ or ‘way ‘ is at first an appellation of the Christian community, but becomes more centred on the figure of Jesus who says ‘I am the way’ (Jn 14:6) for he is the essence of the ‘way’. The further descriptions, ‘truth’ and ‘life’, are epexegetical commentaries on the word ‘way’, meaning that Jesus is the true and life-giving way. The following sentence ‘no one comes to the Father except through me’ is a further analysis of the word ‘way’. In other words, he is the way, which nothing else can supersede or replace. It was pointed out that in Christianity the command is given to the disciples to go and teach. (Mt 28:19-20) Discipleship and commission go together. Do Muslims have the task of spreading Islam? It depends on the meaning of word da’wa, which means the ‘call’ or invitation to Islam. There are also Muslims who go out and convey the message to others (tabligi jamaat). Other Muslims feel that their duty is simply to give witness to the truth of Islam in their daily lives. Thus he style of da’wa is variously interpreted. The question was asked about what corresponds to the call in the Gospel to feed the poor etc. Is there such a thing in Islam? What is the call to social justice? Zadaqa (‘spending for the sake of others’) is an important element as shown in some places where the poor are fed at no cost. But the obligation of zakat, one of ‘the five pillars in Islam’, has a different meaning. It is a tax designed to promote equality in the community. Every Muslim believer must contribute a certain amount from his regular income to the needs of the community. Thus zakat is to be distinguished from zadaka. The essence of the ‘way’ in 29:69 is submission. It is first and foremost submission to God, who reveals Himself through the Qur’an and not submission to the Prophet Muhammad, whose role is to be the perfect example of how the Qur’an should be lived out. The true Muslim who submits to God through the revelation of the Qur’an will strive to imitate Muhammad. This is different from the relationship between the Christian and Jesus, which is not customarily termed ‘submission’ but ‘faith’. The distinguishing mark of the Christian is faith in Jesus as the Christ. In Islam, the believer is one who has faith in God and in Muhammad who is God’s Messenger. The Christian disciple is called to follow Jesus. Submission to Allah does not have such an inherently dynamic sense. 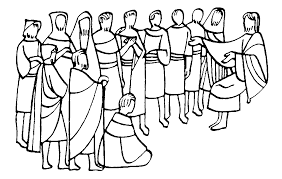 In the Gospel the first four disciples are called to follow Jesus (Mark 1:16-20), and in the very last chapter of John, the last words of Jesus are ‘Follow me’. (Jn 21:22) This call suggests movement. Where is Jesus going? Mystery and uncertainty are inherent in Christianity. He is the way and to follow him means walking the same path, which is that of sacrifice etc. Jesus is constantly moving. Is the movement eternal? The God of the Christians is not a static God as might be said of the Platonic forms. It was pointed out that the phrase, ‘Obey God. Obey Muhammad’ (Al-Nur 24:54) is very strong, for it links God and Muhammad in parallel literary form. However, it would be contrary to the spirit of Islam to see the same closeness as in the phrase from John ‘He who sees me sees the Father’. (Jn 14:9) The Muslim believes in Muhammad only in the sense that he is acknowledged as a perfect example of the message of the Qur’an. Many topics were raised within the scope of the theme of discipleship. The question arose about the meaning of the term ‘prophet’. The Qur’anic text has two terms: rasul and nabi. The word rasul refers to one of the five historical persons who have produced a Book: Abraham (although his Book has been lost); Moses, through whom the Torah was revealed; David, through whom the Psalms were revealed; Jesus, through whom the Gospel was revealed and Muhammad, through whom the Qur’an was revealed. The nabi are those appointed by God to call a corrupt age back to the purity of the revelation. In the Qur’an, some nabi are named (Adam, Noah, John the Baptist, etc.) but there are countless others who are not named. Some Muslims would even include the Buddha, for example, as one of the nabi. In Islam the Qur’an, as already noted, is the revelation that God sent down in the form of a written text through the medium of Prophet Muhammad. By contrast in Christianity Jesus Christ as the Incarnation of God’s Word (Jn 1: 1-4 + 14), is the culmination of divine revelation. Hence we cannot compare Jesus Christ with Muhammad but should compare him with the Qu’ran. Though the prophetic identity of Jesus is emphasised in the Synoptic gospels, in the New Testament in general, Jesus Christ is the Son of God, Emmanuel, God with us, the image of God as a true human, appearing in the universe. This would merit further examination. The perfection of Muhammad is implied in the Qur’an and developed further in the tradition of Islam. The question was asked as to why Muslims became offended when Muhammad was criticised in any way. One reply was that Muslims have an intense devotion to the person of Muhammad, so that any criticism of him is seen as injurious to them. It is like our attitude to our parents who, we know, are not perfect but we will not tolerate any criticism of them. On the Last Day, no one will have the power of intercession except those to whom Allah gives permission [Surah Maryam (19), 87]. Some verses seem to imply that the Prophet will be given permission to intercede on that day. Moreover, a few verses in the Qur’an are interpreted by Muslims to refer to the second coming of Jesus [cf. Surah Al-Nisa’ (4), 159 and Surah Zukhruf (43), 63] but the Hadith traditions give a much clearer picture of the way Jesus will come again before the end of the world takes place. In ‘Pelagianism’, Jesus is the model for our salvation, but not the means. The question arose in our group about the Pelagian aspect of Islam, where Muhammad is the model but not the means. In response the point was made that the Pelagianism that is presented in St Augustine’s teaching on grace may not in fact truly reflect what Pelagius himself actually taught. The point was further made that there appears to be a certain rehabilitation of Pelagius at the moment. However, the point remains that Muhammad is the example but not the means of salvation whereas in Christianity Jesus is both the model and the means. The discussion continued about the relationship between the Muslim and Muhammad. What is the significance of the ‘companions’ (sahaba) of Muhammad? The term as such does not appear in the Qur’an, which simply refers to those who were with the Prophet (m‘ahu, with him). This has a different connotation from the disciples who are ‘with Jesus’. There is an intimacy involved in faith in Jesus, which may not be the case between Muhammad and those who are ‘with’ Muhammad. Do not curse my Companions! Do not curse my Companions! I swear by Him in Whose hand my life is that, even if one among you had as much gold as Mount Uhud and spent it in the way of God, this would not be equal in reward to a few handfuls of them or even to half of that. The helpers (ansar) in the Qur’an were the Medinan Muslims who welcomed and supported the emigrants (muhajirun) from Mecca. Although the word for ‘companion’ (sahaba) does not appear in the Qur’an, these people acted as companions for the emigrants. Among the member of this group, a person is called a novice if he is seeking Him but has not yet obtained his desire. The sheikhs have said, “He is a disciple who, in compliance with his guide, is like a dead man in the hands of the washer – he turns whichever way he is turned! A novice should be so submissive to his guide that, at the slightest hint from the latter, he would gladly offer his life, his spiritual riches, and his worldly goods, but not leave his guide! Discussion continued on the Sufi terms disciple (murid) and teacher/guide (murshid). The Sufi points of view seem to be highly influenced by Indian thought. Sufism starts in the area located between India and Iran and seems to adopt some aspects of Indian thought, particularly on the role of the guru. The term ‘abad is also used to indicate the servants of Allah, not of Muhammad. Their service is to accept and obey the revelation of the Qur’an. The discussion went on to discuss the type of ‘flexibility ‘ that is acceptable for the exegesis of the Qur’an. It was felt that to regard the Qur’an simply as a legal text would diminish flexibility for the exegete. However, there is a ‘spirit ‘ of Allah present in the Qur’an, a certain sense of the truthfulness, which attracts and earns the conviction of the believer. Indeed, it was noted that the very act of submission is itself a guide to the interpretation of the text. The submission of heart and soul and mind leads to a correct understanding of the verse. So submission has priority over reason. The question was asked: is there a presence of Allah in the Qur’an, which could be found ‘between the lines’? In this broader sense, the spirit of God is present in the Qur’an. Indeed, Jesus is referred to as ‘spirit’ (ruah). Are there implications in this appellation for the understanding of the Qur’an? In the Old Testament, there is a strong sense of the Spirit of God pervading everything and giving life. This same sense is evident in the Qur’an but it is taken further in Christianity where the Spirit is seen as personal and divine. Muhammad is beyond criticism and the Qur’an is inimitable because it is the final revelation. However, one person may hear the Qur’an and make their submission whereas another person may hear the Qur’an and not become a believer. What happens within them that makes their responses so different? The reply was that belief and disbelief are the work of God. Indeed all is the work of God. As the Muslims say: inshallah. Other commentators may add that the angels inspire a person to faith. In the Sufi tradition, the guide (sheikh) has a special role in leading his disciple to faith. Indeed, in the Sufi tradition, one cannot advance along the ‘path’ without a guide (sheikh). The discussion on discipleship was far ranging and vigorous. It has, however, only just begun. Rev. Dr John Dupuche (Senior Lecturer, MCD University of Divinity / Catholic Theological College; Honorary Fellow, Australian Catholic University; member of the Ecumenical and Interfaith Commission; President, Mela Interfaith Association); Dr Herman Roborgh (Honorary Fellow, Australian Catholic University; Board Member, Mela Interfaith Association); Mr Tom Thomas (Board Member, Mela Interfaith Association); Rev. Nick de Groot svd, (Director, Janssen Spirituality Centre; Board Member, Mela Interfaith Association); Rev. Dr Jacob Kavunkal svd (Associate Professor, MCD University of Divinity / YTU). Apologies: Dr Stewart Sharlow (Public officer and Board Member, Mela Interfaith Association); Rev. Dr Merrill Kitchen. This entry was posted in Interreligious dialogue, Melbourne, Muslim Catholic relations, Muslim Christian relations. Bookmark the permalink.